Vacuum frying is a suitable processing method for the production of high quality fruit crispy. With this technology, fruits which are abundant and sometimes wasted at harvest season, can be processed and still have high selling price. The vacuum frying technology ( Fig. 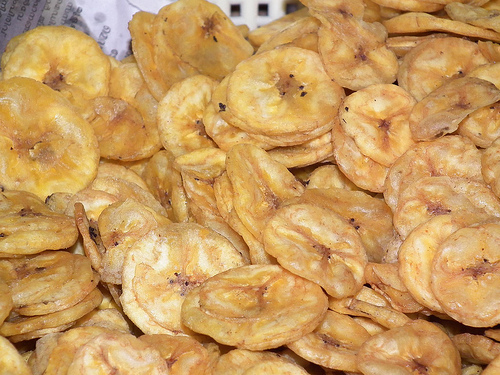 1(559)) produces fruit crispy with original color and fruit aroma and an ideal crispy texture ( Fig. 2(527)). The crispiness is obtained because the process of moisture content reduction in the fruit occurs gradually. Select fruits with optimum maturity and medium fruit meat. Shell the fruit, drain, and blanch if needed. Fill water tank until ± 3 cm from the circulation tank surface. Put cooking oil into frying tube up to the fruit basket base. Turn temperature control button “on” and switch gas stove on. Put 3.5 kg material into frying basket and close the lid. Put the frying basket lid and lock, close vacuum cleansing faucet, switch on the pump, open water circulation faucet, and wait until water comes out from water hose of upper condenser. After the vacuum meter has reached 700 mmHg, put frying basket into cooking oil by turning the stirring lever 180º. Shake stirring lever every 5 minutes. After the fruit crispy has been cooked, lift frying basket by turning stirring lever 180º and lock. Switch off the pump, stove, and water circulation faucet, and open vacuum releasing faucet slowly until vacuum meter reached 0. Open the frying tube lid and frying basket, lift fruit crispy up, and drain on spinner (drying machine). Pack fruit crispy in alluminum foil or propylene plastic with 0.8 mm thickness, and seal. Figure 1 Vacuum Frying Machine. Figure 2 Fruit Crispy Products.